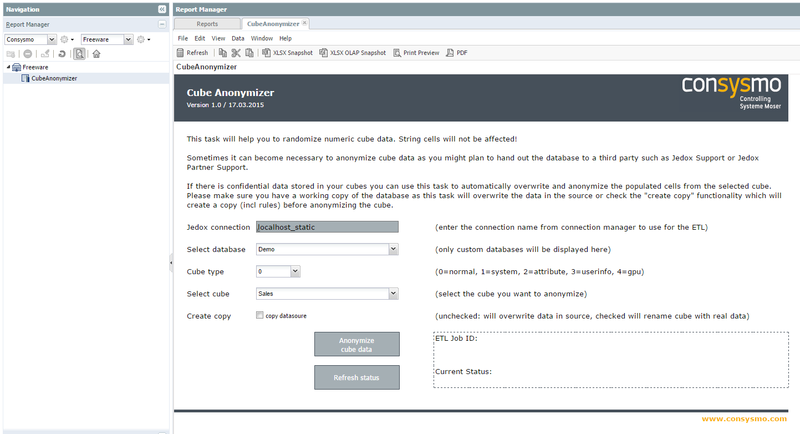 As we recently had the case that we wanted to anonymize specific cubes but not the full database itself for a cloud demonstration we created this project. With the CubeAnonymizer you can randomize pre-filled numeric data cells in any cube out of your Jedox installation. This can be especially interesting if you want to test performance on a cloud instance (our case) or demonstrate applications without the sensitive data. Even if you simply want to hand in a database to Jedox Support or a partner without sending confidential company data over the internet this could be useful for you. To install the project download the files from this blog post and import the .pb file into your Jedox File Manager. 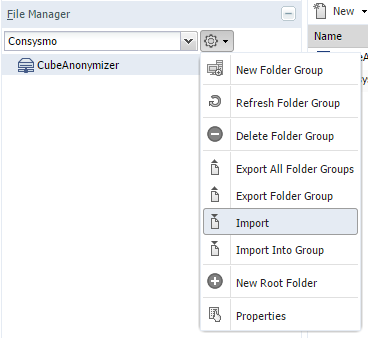 Doing so you will create a specific folder group „consysmo“ with the contents automatically. The CubeAnonymizer is now ready to use. You may want to publish the spreadsheet in Report Manager in order to make it available for your end users.